Although concurrent alcohol intoxication is not a contraindication, synergistic effects on CNS and ventilation may lead to respiratory compromise. Consider using a lower starting dose. Benzodiazepines are the first line agent to treat status epilepticus, but other pharmacologic interventions may include propofol, fosphenytoin or phenytoin (but not for drug induced seizures), valproic acid, phenobarbital, pentobarbital and even high dose pyridoxine (Vitamin B6) for INH/hydrazine exposures. Midazolam (Versed) is preferred for overall shorter duration of action. Start with half-dose to avoid prolonged sedation. Older patients can be more sensitive to the sedative and respiratory depressant effects of benzodiazepines. Rectal, buccal, and intranasal formulations of benzodiazepines are frequently used in outpatient setting for abortive therapy. 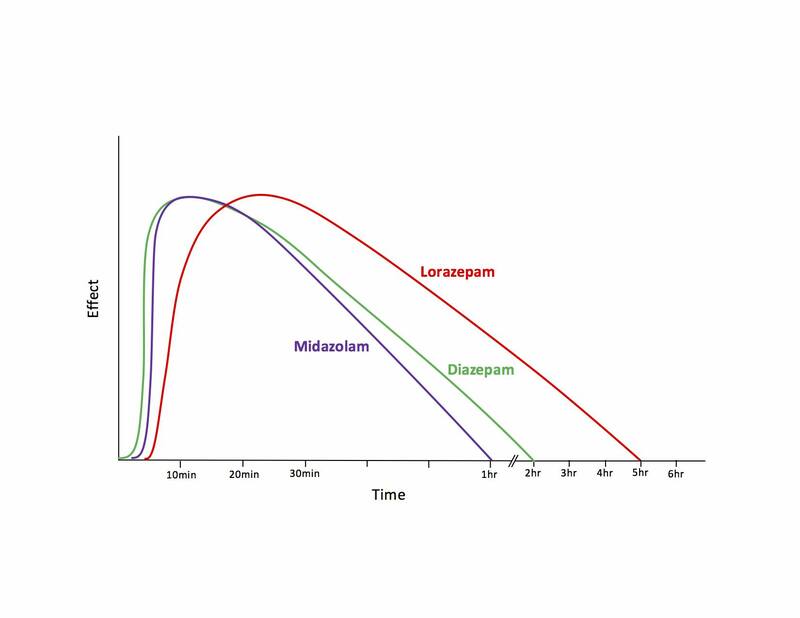 The RAMPART study (Silbergleit 2011) demonstrated IM midazolam was non-inferior to IV lorazepam (2-4 mg) in the pre-hospital setting. However, in the emergency department, IV administration is still typically preferred whenever possible. 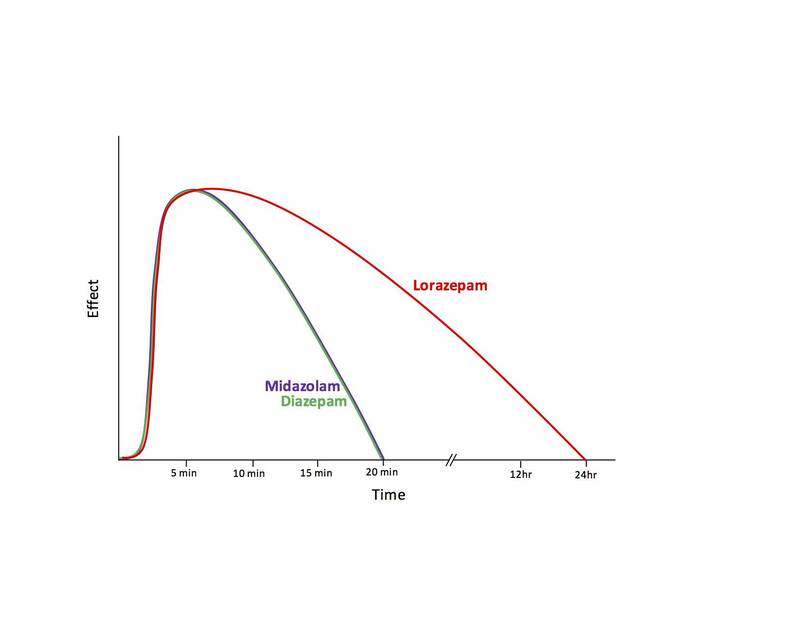 IV Lorazepam and diazepam are equivalent in both efficacy and safety outcomes in the pediatric population (Chamberlain 2014). Paradoxical reactions may be seen with increased agitation following administration. This is thought to be secondary to disinhibition and may respond to larger doses. IV administration may produce mild reduction in heart rate and both systolic and diastolic blood pressure, but direct myocardial effects are rare. End-tidal CO2 (EtCO2) monitoring should be used if available but may not be entirely reliable. Arterial blood gas (ABG) analysis is indicated if such monitoring if not available or the EtCO2 readings are not consistent with the clinical findings. Supplemental oxygen may mask objective signs of hypoventilation. It should only be used if the patient is continuously clinically monitored. Hoffman RS, Nelson LS, Howland MA. Antidotes in depth: Benzodiazepines. In: Hoffman RS, Howland MA, Lewin NA, et al. Goldfrank’s Toxicologic Emergencies, 10th ed. New York: McGraw Hill Professional, 2015: 1069-1075.